Author: Posadas, Carmen Set In . . . Description: Rafael Molinet Rojas, an inconspicuous Spaniard living in London, regrettably finds that there is nothing worth living for when his closest companion–his mother–dies. 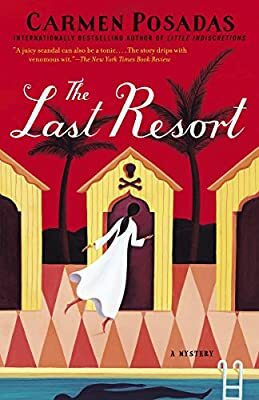 Hoping to make a dignified–and, although he won’t admit it, dramatic–exit from this world, Molinet plots his escape, picking an elegant setting for his suicide via sleeping pills: Morocco’s L’Hirondelle d’Or, one of the most luxurious resorts in the world. There, he will be able to forget his cares, drape himself in a white caftan, and try to make a little money playing backgammon before he does himself in. The day before his trip, Molinet has a lunch date with his vivacious niece–who enthralls him with the story of a scandalous and deeply suspicious death. Jaime Valdés, high society lothario, has seemingly choked to death in the presence of both his mistress and his wife, but all of Spain is atwitter with the possibility of murder. Coincidentally, when he arrives at the spa, Molinet realizes that the stylish woman sitting by the pool is none other than Valdés’s widow. And when a throng of gossipy Europeans arrive on the scene, it quickly becomes clear that despite its air of tranquility, many sinister things are happening at L’Hirondelle. Before he knows it, Molinet’s eavesdropping leads to a startling turn of events. Internationally bestselling author Carmen Posadas has created a corrosive and witty high society whodunit in the vein of Agatha Christie’s Murder on the Orient Express. The Last Resort mixes poolside cocktails and acid-laced gossip with privilege and murder to marvelous effect.